Descriptive terms in reference to the economic capacity of countries or world regions are used for purposes of clarity and comprehensibility and are not intended to express any personal opinions of the author. The parties to the case were however mostly not satisfied with such ‘inconvenience’ resulting from the ‘hard nosed’ municipal Common Law and started to seek redress from a higher authority — in this case the King of England. This (royal) remedy is based on the concept of ‘Equity,’ which — as understood in this paper — was applied to correct unjust outcomes and referred to considerations of fairness, and reasonableness. Eventually, the foremost municipal concept of Equity found entry into international jurisprudence. However, mostly civil law countries — whose approach towards Equity was and is more reluctant — were challenging this understanding, arguing that the Court “should work on the basis of existing rights,” in Public International Law a distinction of different ‘Equities’ was developed. As will be shown, the usage of some of these ‘Equities’ is highly controversial, whereas others are today nearly commonly accepted as part of today’s Public International Law. Beginning with earlier judicial decisions of international legal bodies that applied equitable principles, to the significant position the concept was given in the 1982 United Nations Convention on the Law of the Sea (1982 LOS Convention), and concluding with its application by judicial bodies today, this paper aims to examine to which extent the principle of Equity found entry into the Law of the Sea (LOS). As equitable principles were commonly applied in connection with disputes revolving around the LOS, an examination of the implications is necessary. Such need is emphasized with the coming into force of the 1982 LOS Convention, where the application of the concept of Equity was significantly laid down, for most countries — industrialized and developing countries alike. Further, in the course of this paper, the doctrinal debate between positivism and natural law regarding the role of Equity in Public International Law will be discussed. Specific literature focusing on the usage of Equity in the LOS does not exist, as most legal scholars and international judicial bodies (the latter even when applying equitable principles in their decisions) refer solely to Public International Law’s general conception of Equity. Especially since Equity was explicitly inscribed by the 1982 LOS Convention, this lack of particular consideration of its implications on the new LOS is apparent. One of the few authors paying tribute to the distinct position of Equity in the 1982 LOS Convention is M. N. Shaw. However, although highlighting the significance of the concept in the new LOS, he does not elaborate on its implications for this area. 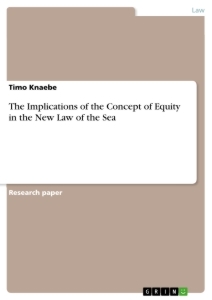 The same applies to W. Heintschel von Heinegg and S. K. Kapoor, who in their latest edition elaborate on the concept of Equity — the latter even referring to its implementation in the 1982 LOS Convention — however fail to analyze the latest developments in the judgments of international judicial bodies concerning sea-related problems. Other authors like R.-J. Dupuy and D. Vignes or D. P. O’Connell, albeit mentioning the position of Equity in the 1982 LOS Convention, do not analyze the legal problems arising out of implementing such vague concept in positive law. The methodological approach is based on the collection of material from the Dar-Gent Law of the Sea Centre, the University of Dar es Salaam’s main library (law collection), the faculty of law library, and the library of the University of Cologne/Germany. Further, the author’s own collection of literature and — to consider recent developments — periodicals in addition to the World Wide Web are drawn as sources. The notion of applying equitable principles in Public International Law is sourced in English municipal law of the fourteenth and fifteenth centuries. At this time, the initially highly efficient system of Common Law courts — instigated by William I. in the aftermath of 1066, the beginning of the Norman conquest of England — led to unsatisfactory results. Due to factors such as, inter alia, the absolute independence of the judges, and the strict binding effect of precedence, the evolving rigor juris became increasingly seen as unjust, as the limited number of writs was seen as inadequate to meet the changing social and economic requirements of the outgoing Middle Ages. common lawyers in fact were beginning to feel […] the delight of pushing a principle as far as it will go and even further. Although those petitions were traditionally refused by stating “May he sue at Common Law,” the King, derived from his oath of office to do his subjects justice eventually assumed the right to offer remedy in cases of apparent injustice. The king’s new notion of justice was in the fashion of time — early Renaissance — a continuation of Aristotelian thoughts. The Greek philosopher had foreseen that the lawgiver could draft laws in general terms only. Consequently, laws could not attain their intended purpose in every case. Accordingly, in special cases the law needs to be ‘tempered’ by Equity in order to achieve a ‘just’ result. Such result is one the lawgiver would presumably have sought, if he had foreseen the exceptional case. Therefore, Equity was a corrective means to implement the assumed will of the lawgiver. However, the petitions to the king seeking Equity increased dramatically, thus making it necessary in the fifteenth century that their processing had to be delegated from the Royal Council to the Chancellor of Exchequer. Over time, the latter developed a routine in the handling of similar cases. As early as the sixteenth century “working rules” — that later became the “Maxims of Equity” — had been developing. Since 1660, regular reports of the “Chancery Cases” were published and with the publication of the well-founded judgments contained therein, the law based on equitable precedence gained finally acceptance. The practice of the English kings to receive petitions even of civil cases that were traditionally assigned to Common Law courts however led to a constitutional conflict between the Chief Justice of the King’s Bench (for Common Law) Sir Edward Coke and the Chancellor of Exchequer, Lord Ellesmere. This dispute escalated in 1616 and made the King extend the competence of the Chancery Jurisdiction to resume even cases already completed by the Common Law Courts. Out of this, an equally independent legal system of Equity started to develop, which in the beginning worked in competition with — later increasingly along — the strict Common Law system. In mid-nineteenth century, a reform of the structure of the judiciary system led to the merger of the parallel systems. Since then, Equity has been used only as a description for those legal areas, which were developed through Equity case law — such as “unjust enrichment,” “trusts,” or “mortgages” — established by the Equity courts. [S]he who comes into equity must come with clean hands [T]hus the doors of equity are closed to one tainted with inequitableness or bad faith relative to the matter in which [s]he seeks relief, however improper may have been the behavior of the other party. Accordingly — hence acknowledging the relevance of Equity and the concept of fairness for Public International Law — in the landmark Maas Case Judge Manley O. Hudson held that a State seeking the interpretation of a treaty must itself have completely fulfilled the obligations of that treaty. This conception was confirmed by Judge O. Schwebel in his Dissenting Opinion to the Case Concerning Military and Paramilitary Activities in and against Nicaragua (Merits). Yet even before, international legal scholars drew — like in municipal law — on Aristotle in their search for justice. Most prominently, Hugo Grotius who in his seminal treatise in 1625 called inter alia for the interpretation of treaties taking into account the principle of Equity. so, also reflecting the different self-image and the stronger position of the judiciary in this legal sphere. As the references to Equity and the equitable powers of international tribunals increased in the nineteenth and twentieth centuries, a doctrinal debate between positivists and supporters of the concept of natural law regarding the role of Equity — meaning the role of the judge — in Public International Law arose. Followers of the positivist school argued that the judiciary’s high-handed correction of positive rules of law as laid down by the ‘legislative’ (i.e. mainly the States), would constitute an unwarranted encroachment on Public International Law’s still highly cherished domain — State sovereignty. Conversely, the advocates of natural law applauded Equity and judicial discretion as a means to attain — as expressed in the quotation in the beginning — more fairness and justice in Public International Law. For legal positivists, these three ‘Equities’ constitute a spectrum moving from the less to the more objectionable. Equity intra legem is the only Equity immanent in positive law. While taking into account the particular circumstances of a case, it is aimed at extenuating hardships. Equity in this sense shall allow for the possibility of choosing such variant among different readings of the law, which best reflects the specialties of the concrete case and the situation of the parties by considering their respective rights and obligations. Equity intra legem is determined by the existing legal framework and constitutes an element of the legal norm itself, while the other forms of Equity originate from outside. As will be shown below, the 1982 LOS Convention does in several Articles include Equity intra legem. The function of Equity praeter legem (also referred to as Equity infra legem) partly lies in filling gaps in cases in which the law is silent in regards to a concrete question or does only contain insufficient regulation. Essential for this form of Equity is — although extralegal — its attachment to (or, respectively, from within) the existing Public International Law, thus having a supplementing effect on the latter. Neither State-practice nor legal theory so far asserted Equity praeter legem as being part of contemporary (Customary) Public International Law. Continental Shelf Case (Tunisia v. Libyan Arab Jamahiriya), I.C.J. Reports 1982, pp. 18, 60. Burkina Faso v. Republic of Mali Case, I.C.J. Reports 1986, pp. 554, 633. OLDHAM, J., English Common Law in the Age of Mansfield, Rosewood: North Carolina Press, 2004, p. 5. Free Zones of Upper Savoy and the District of Gex Case, PCIJ Ser. A, No. 24, 1930, p. 10. A writ is a, by time increasingly limited, form of action commanded from the King. It is the prerequisite for a plaintiff’s case to be brought before a court (OLDHAM, J., English Common Law in the Age of Mansfield, Rosewood: North Carolina Press, 2004, pp. 7-9). ZIEGLER, K.-H., Voelkerrechtsgeschichte, Munich: C. H. Beck, 1994, p. 148. OLDHAM, J., English Common Law in the Age of Mansfield, Rosewood: North Carolina Press, 2004, p. 112. JANIS, M. W., “Equity in International Law,” in BERNHARDT, R. (ed. ), Encyclopedia of Public International Law, Vol. II , Amsterdam: North Holland, 1995, p. 109. OLDHAM, J., English Common Law in the Age of Mansfield, Rosewood: North Carolina Press, 2004, p. 155. LONG, B., The Quarrel Between Law and Equity, [Online] Available: http://www.drbilllong.com/LegalHistory/1616.html, 12 October 2004, accessed 25 May 2006. United States v. Perez-Torres, 15 F. 3d 403, 407 (5th Circuit 1994). BROWN WEISS, E., “Intergenerational equity: A legal framework for global environmental law,” in BROWN WEISS, E. (ed. ), Environmental change and international law: New challenges and dimensions, Tokyo: United Nations University Press, 1992, pp. 386. Also known as Division of Water from the Meuse Case. PCIJ Ser. A/B, No. 70, 1937, pp. 76-9. I.C.J. Reports 1986, p. 272. ZIEGLER, K.-H., Voelkerrechtsgeschichte, Munich: C. H. Beck, 1994, pp. 168-9. SHAW, M. N., International Law, Cambridge: Cambridge University Press, 2005, p. 100. Dissenting Opinion of Judge Hudson in PCIJ Ser. A/B, No. 70, 1937, pp. 76-9. JANIS, M. W., “Equity in International Law,” in BERNHARDT, R. (ed. ), Encyclopedia of Public International Law, Vol. II , Amsterdam: North Holland, 1995, pp. 110-1. HEINTSCHEL VON HEINEGG, W., “Das Gewohnheitsrecht,” in IPSEN, K. (ed. ), Voelkerrecht, Munich: C. H. Beck, 2004, p. 248. BROWNLIE, I., Principles of Public International Law, New York: Oxford University Press, 2003, p. 25. SHAW, M. N., International Law, Cambridge: Cambridge University Press, 2005, pp. 100-1. This authorization is given by the States as primary subjects and ‘legislators’ of Public International Law. Also known as Free Zones of Upper Savoy and the District of Gex Case.